Norway’s Lofoten archipelago is famous for its spectacular scenery with dramatic mountains and views of the northern lights—but its remote location up north also means a bitterly harsh climate in winter. 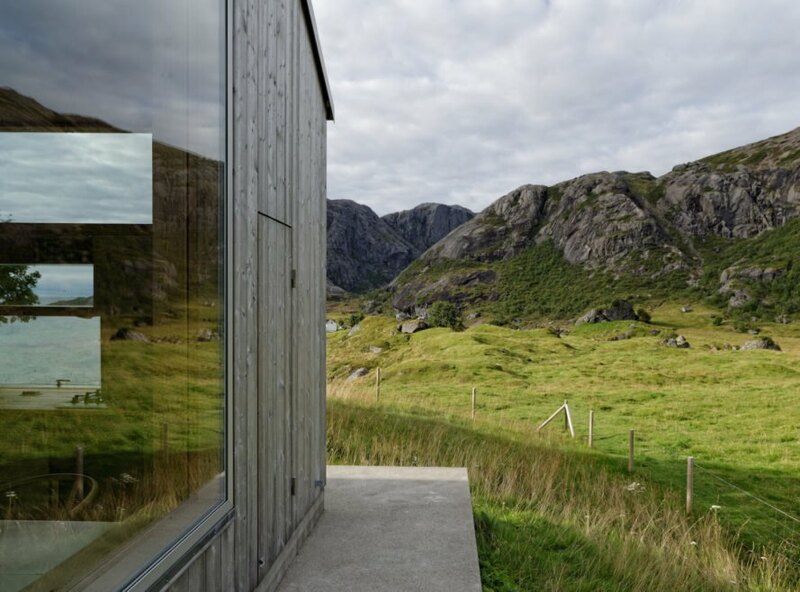 Architect Carl-Viggo Hølmebakk was asked to create a summer retreat on a coastal Lofoten island that would be strong enough to withstand the harsh climate, particularly high-speed winds and rain. 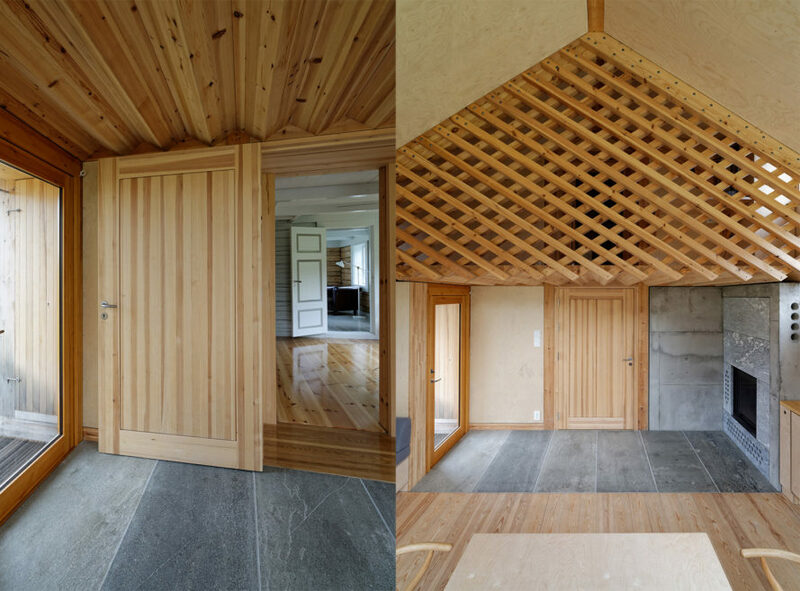 He and his team of architects completed the Summer House Gravråk, a renovated timber structure with a new addition and beautiful modern interior. 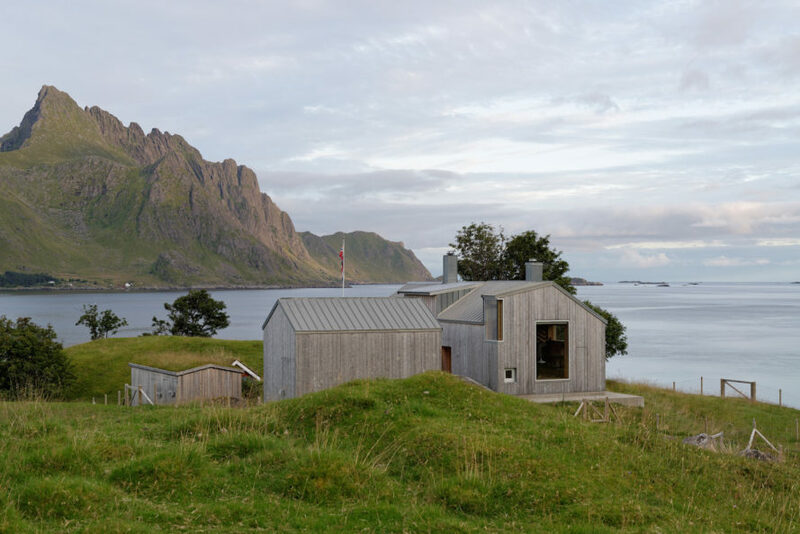 The 25-square-meter Summer House Gravråk began with the rehabilitation of an old “Nordlandshus,” a kind of a traditional northern Norwegian home with a gabled roof and timber structure. The architects extended the building’s existing footprint with an addition towards the west that matched the original structure’s design. The exterior is clad in untreated spruce, which developed a gray patina after exposure to the elements. Standing seam zinc roofing tops the building. The extension is constructed with prefabricated pine glulam and is wind-anchored to an encapsulating concrete slab that serves as a stabilizing counterweight, while the existing building is guy-wired to the ground. “The addition is a pure extension of the existing building, and re-uses the geometrical principle with asymmetrical dormer windows to let in light and give a view from the loft,” write the architects. The windows are constructed with aluminum frames on the exterior and wood on the interior to match the interior birch plywood cladding. 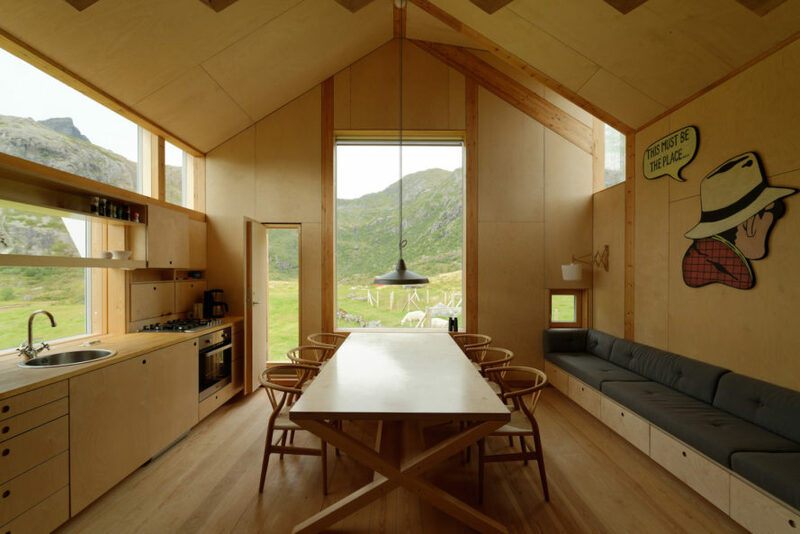 The interior is minimally furnished and the abundance of windows keeps the focus on the landscape. The architects also constructed a small green-roofed annex separate from the main building. 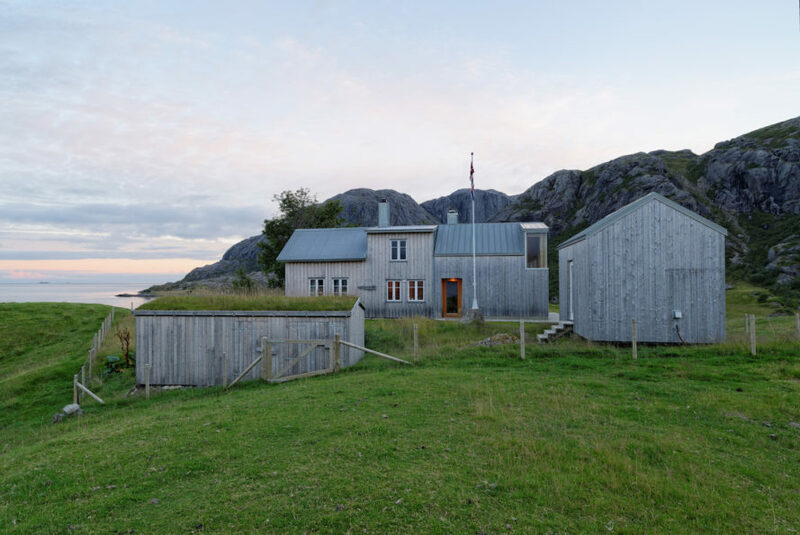 The 25-square-meter Summer House Gravråk began with the rehabilitation of an old “Nordlandshus,” a kind of a traditional northern Norwegian home with a gabled roof and timber structure. The architects extended the building’s existing footprint with an addition towards the west that matched the original structure’s design. The exterior is clad in untreated spruce, which developed a gray patina after exposure to the elements. Standing seam zinc roofing tops the building. The extension is constructed with prefabricated pine glulam and is wind-anchored to an encapsulating concrete slab that serves as a stabilizing counterweight, while the existing building is guy-wired to the ground. “The addition is a pure extension of the existing building, and re-uses the geometrical principle with asymmetrical dormer windows to let in light and give a view from the loft,” write the architects. The windows are constructed with aluminum frames on the exterior and wood on the interior to match the interior birch plywood cladding. The interior is minimally furnished and the abundance of windows keeps the focus on the landscape.